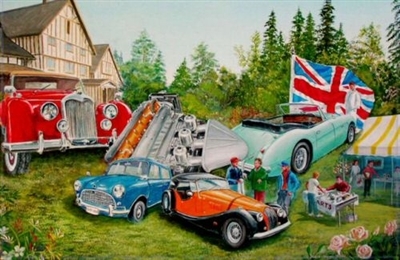 Studio on Dogwood can provide acrylic or oil paintings of your favourite automotive subjects, in any landscape or fantasy background setting on canvas…including murals for outdoor or indoor display… Prices are separately quoted on each individual commission. All that is needed are good photos of the subject vehicle, a description or photos of the background, as well as the size of the painting required. Orders can usually be filled within ten working days of receipt of order. Click To view my automobile paintings.